Cyclops returns, Wolverine goes cosmic and the Age of X-Man begins in Marvel's February 2019 X-Men solicitations – AiPT! A rundown of every X-Men title being released in February 2019. When I spoke to X-Men Group Editor Jordan D. White earlier in this very Uncanny X-Month, he promised 2019 would change everything for the X-Men. Based on Marvel Comics’ February 2019 solicitations, that certainly looks to be the case for the children of the atom. 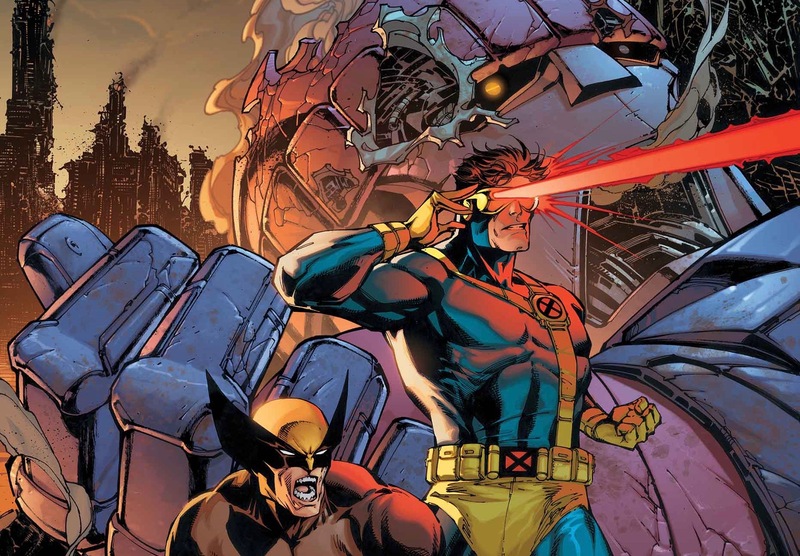 From the long-awaited return of Scott Summers to Wolverine slipping on the Infinity Gauntlet, the shortest month of the year looks to be overflowing with reasons for X-Fans to be eXtra eXcited! Oh, and did I mention that a little event called the Age of X-Man kicks into high gear? Read on to see what adventures await the X-Men in February 2019! in the business: Stunt coordinator Magma! Personal trainer Kylun! And of course, his leading lady Meggan! A perfect world doesn’t just…happen. It needs to be cultivated. That’s where the X-Tremists come in. Psylocke, Iceman, Northstar, Blob, Jubilee and Moneta protect people from threats they won’t even know existed, including the most insidious threat of all — love. At last! It’s Weapon H versus his predecessors–Wolverine and the Hulk! Once, the Weapon X program sought to recreate the world’s two greatest hunters. They ended up with Weapon H, a man of Adamantium claws and gamma-juiced blood. Now, Wolverine and the Hulk are back in action — and coming after the dangerous creation made in their name! Plus: A special appearance by your least favorite X-Man! The mystery surrounding the X-Assassin grows, as Laura investigates its origins and Gabby does her best to find the humanity deep in its robot heart… But the X-Assassin isn’t the only threat facing the sisters! Shatterstar goes toe-to-toe with the only opponent with a prayer of taking him down…himself! Plus: One of Shatty’s tenants fulfills their destiny! Someone has stolen Deadpool’s heart…LITERALLY. The Merc with the Mouth hires the Snoop with a Private Eye, Jessica Jones! You’ll never guess where this twisted trail leads!!! The “INFINITE HOUSE OF CIVIL yet SECRET CRISIS WAR INVASIONS” begins here! The BIGGEST arc of SPIDER-MAN/DEADPOOL kicks off this month and will shake the foundations of the Marvel Universe! Nothing will ever be the same after this issue! NOTHING! Spider-Man and Deadpool just BARELY make it back from the Negative Zone in the middle of an Event that the Marvel U’s heroes have already lost. She’s a singer, not a fighter — but Dazzler was always destined to be one of comics’ brightest stars! Journey back to the days of disco to join Spider-Man, the Avengers and the X-Men in welcoming Alison Blaire to the Mighty Marvel firmament with this impeccable facsimile of the first issue of Dazzler’s sparkling solo series! Alison’s mutant powers place her at a career crossroads. Can she be a singing sensation? A stellar super hero? Or both? But when Alison dons her iconic roller skates to make an important audition, will she dazzle everyone — or will the Asgardian Enchantress steal the show?! It’s a landmark issue of the 1980s, re-presented in its original form, ads and all! The flagship X-Men title that started it all is back — bigger and better than ever! Why is the X-Men’s newest crisis shaping up to be…their final adventure?! It all starts with a mysterious and tragic disappearance, but their investigation draws the X-Men into a much larger — and deadlier — situation! Who or what are the Four Horsemen of Salvation, and what is their connection to Nate Grey, the incredibly powerful mutant known as X-Man? Will Nate’s home dimension, the Age of Apocalypse, make its horrifying return? Or does the dawn of the Age of X-Man mean the end of the Uncanny X-Men?! It’s a status-quo-smashing story that just might leave all of mutantkind in tatters, and it will take three fan-favorite writers to deliver the mutant madness! Collecting UNCANNY X-MEN (2018) #1-10. Iceman is back in his own solo series! Someone is hunting the sewer-dwelling Morlocks for sport, and it’s up to Bobby Drake to prevent another Mutant Massacre in the making — but it’s going to take everything he has not to lose his cool. Who’s behind this horrific hunt? You won’t believe it if we tell you! And what part does Iceman’s former teammate Bishop, the cop from the future, play in all this? Plus: When a super villain crashes Bobby’s blind date, he needs a wingman and wingwoman. It’s time for the tripartite team-up you’ve been waiting for: Iceman and his Amazing Friends, Spider-Man and Firestar! And things are looking great when New York finally throws its first Mutant Pride Parade, until things take a turn for the…Sinister! Collecting ICEMAN #1-5 & Uncanny X-Men: Winter’s End #1. Their wedding shocked the world — now Gambit and Rogue are husband and wife, and their honeymoon will be uncanny! In their extraordinary lives, Gambit and Rogue have faced nearly every challenge imaginable. But now that the Marvel Universe’s hottest couple has tied the knot, how will they cope with married life, X-Men-style? By going interstellar! Being tasked with protecting a mysterious package everyone in the galaxy seems to want makes for a pretty bizarre honeymoon, but could anything be worse than Deadpool crashing the party? Yes! The Technet crashing it, too! Not to mention the Shi’ar Imperial Guard, Deathbird, the Starjammers and a whole Empire in turmoil! What the heck is in this package, anyway?! And will Gambit and Rogue ever make it home? Collecting MR. AND MRS. X #1-6. The adventures of the newly resurrected Jean Grey and her handpicked team continue! One of the X-Men’s greatest foes has come calling on Namor’s undersea kingdom of Atlantis, and they’re determined to bring about its end! Jean Grey and the Red team find themselves out of their element and under the sea as they must repel a devastating attack! Plus: The world grows more hostile toward mutants every day, and one of the X-Men’s fiercest foes is working behind the scenes to keep it that way! But Jean has had enough of the hateful world she was reborn into, and it’s time for her to confront the one responsible head-on. Prepare for a seismic showdown between Jean Grey and Cassandra Nova! Collecting X-MEN: RED #6-11. Magneto. Mojo. Mystique. Juggernaut. Emma Frost. Apocalypse. The X-Men have gone head-to-head with all of them countless times over the years – but now the villains are the stars! From the cold vacuum of space to the jungles of the Savage Land, from dominating a secret society’s inner sanctum to crashing through all walls in their way, these titanic tales show what makes the X-Men’s opponents the most formidable in the universe. Chris Claremont sets Magneto on a new path! Mojo finds…love? Mystique delivers revenge-fueled chills, seductive thrills and brutal kills! Emma Frost sets her sights on the Hellfire Club! Nothing can stop the Juggernaut…until now! And a transformative tale of Apocalypse that must be seen to be believed! Collecting X-MEN BLACK – MAGNETO, X-MEN BLACK – MOJO, X-MEN BLACK – MYSTIQUE, X-MEN BLACK – JUGGERNAUT and X-MEN BLAC – EMMA FROST. Typhoid Mary is back in Manhattan, and she has her sights set on Hell’s Kitchen! With Daredevil preoccupied trying to take down Mayor Fisk, there’s a power vacuum in New York’s most dangerous neighborhood, and the psychotic pyrokinetic aims to fill it with her own unique brand of chaos. But Daredevil isn’t the only guardian watching over the Kitchen, and Spider-Man is about to prove it! When mutants and humans alike get caught in the crossfire, the X-Men have no choice but to intervene — only to find themselves squaring off against Spidey! Luckily, Iron Fist is in town and willing to lend a hand — but can Danny Rand stop Typhoid Mary’s flames from spreading, or will he just add fuel to the fire? Collecting TYPHOID FEVER: SPIDER-MAN, TYPHOID FEVER: X-MEN and TYPHOID FEVER: IRON FIST. Domino has a dangerous new mission! Pale skin, black hair, skintight bodysuit — no, we’re not still describing Domino…here comes Morbius, the Living Vampire! But who is preying on whom? Domino’s luck seems to have a mind of its own sometimes, whether her intentions are noble or not. So perhaps a very special guest could give her a refresher course on luck-based powers? And maybe join her on a little trip to the Mojoverse? We know, it’s a real long shot. Plus: At last, the origin of Domino’s posse, Outlaw and Diamondback! The first appearance of the strange group known as the RejeX! And will Domino rekindle her brief romance with Colossus? Collecting DOMINO (2018) #7-10 and ANNUAL #1. In the wake of Logan’s death, friends and foes alike grapple with grief! As Wolverine’s students mourn, Nightcrawler turns to his faith and the X-Men share stories from Logan’s long history! But what will happen to Wolverine’s body, entombed in Adamantium? As the battle for control of this valuable artifact begins, X-23, Sabretooth and Lady Deathstrike step forward from the long shadow of Wolverine’s legacy! Sinister strikes, Logan’s vicious son Daken lies crippled, death looms for Shogun’s Weapon X crew — and Mystique is playing deadly chess with them all! But what is her hidden agenda? Plus: Meet Fantomelle, the world’s most unstoppable thief! Who is Wolverine’s extraterrestrial friend Fang, and what does he want? And can “the Wolverines” prevail in an assault on Sinister’s fortress? Collecting NIGHTCRAWLER (2014) #7, WOLVERINE & THE X-MEN (2014) #10-11 and WOLVERINES #1-20. Savage tales featuring atmospheric artwork by Marvel’s finest artists! An old friend’s death leads Logan to Nick Fury…and the Swift Sword terrorist organization! But what is the surprising secret under the new Scorpio’s mask? Then, Wolverine travels to the untamed jungle of the Savage Land — so why is he fighting cyborgs? And which longtime X-Men foe is responsible? When his old foe Roughouse is kidnapped, Wolverine follows a trail of tainted cocaine from Madripoor to Central America — but can the young revolutionary La Bandera help a sick and infected Wolverine survive against Tiger Shark and bring down a corrupt regime? Plus: Logan must avenge an old friend, but can he uncover the secret of the Master Form — without his memories? Collecting WOLVERINE (1988) #17-30, WOLVERINE/NICK FURY: THE SCORPIO CONNECTION and WOLVERINE: THE JUNGLE ADVENTURE. When Deadpool cashes in by franchising out his look, Stingray, Masacre, Solo, Foolkiller, Terror and Slapstick suit up as the Mercs for Money! But they’re all about to learn that Deadpool is a terrible boss, and the risky missions Wade assigns just aren’t worth the cash he’s (barely) paying! Before long the M4M are revolting, and a new squad forms — with Domino calling the shots! Then, remember back during the original Secret Wars, when Deadpool found the symbiotic costume that would later bond with Spider-Man? No? Well, the costume remembers — and months later when Spidey rejects it, the costume tracks down DP again! Witness an untold story from Wade Wilson’s past as Deadpool goes back in black! Collecting DEADPOOL & THE MERCS FOR MONEY (2016A) #1-5, DEADPOOL & THE MERCS FOR MONEY (2016B) #1-8 and DEADPOOL: BACK IN BLACK #1-5. Deadpool has teamed up with, taken down or taken a beating from just about every hero in the Marvel Universe — and no way is the Black Panther going to miss his turn! Prepare yourself for a hilarious romp through Wakanda as Wade Wilson goes on the hunt for the world’s most valuable resource: Vibranium! But why does Deadpool want it? And what will T’Challa make of his motives? While the Panther’s mind is distracted with the possibility of a revolutionary new technology that could change the world, Deadpool is about to learn you don’t bring a sword to a claw fight! Someone’s going to lose their head — but will it be Wade, T’Challa or the villainous Jack O’Lantern?! All this, plus…the unthinkable Pantherpool! Collecting BLACK PANTHER VS. DEADPOOL #1-5. Ever wonder what Gambit does when he’s not with the X-Men? Join Remy LeBeau in the exciting and treacherous terrain of the New Orleans underworld, where his skills and mastery as a thief are unquestioned! But Gambit’s confidence may be his downfall — and his world might soon collapse like a house of cards! When the reanimated dead leave their graves and overrun the streets of the Big Easy, Gambit is the only person who can save the city from a zombie apocalypse! But he’s got even bigger problems: two women, both heartbroken, both angry…and both demanding his head on a platter! Then, the talented thief faces his most dangerous job yet: infiltrating the heavily fortified home of…the X-Men?! You’ve got to read it to believe it, mes amis! Collecting GAMBIT (2004) #1-12 and material from X-MEN UNLIMITED (2004) #3.